The Governor of National Capital District, Port Moresby Hon. Powes Parkop, LLB, LLM and MP after receiving the John Rumbiak Human Rights Defender Award on 27th November, 2013 at the Main Lecture Theater, University of Papua New Guinea. Invitation: Governor Powes Parkop’s Tribute Dinner on December, 21st Saturday, at the Holiday Inn (Ballroom) hosted by Rt.Hon. Powes Parkop, LLB, LLM and MP, Governor of the National Capital District (NCD) is the recipient of the 2013 John Rumbiak Human Rights Defenders Award (JRHRDA - 2013). He wishes to acknowledge the untiring support of colleagues, family, partners and friends in the cause of human rights advocacy for West Papua. The Dinner event is organized by Governor Parkop and supported by Free West Papua Campaign – PNG Chapter (FWPC-PNGC). On this occasion Governor Parkop will formally thanks fellow Papua New Guinean; partners and friends, who enabled him to accomplish various feats, who without their support would have not accomplished recognition in his human rights advocacy work in Papua New Guinea and beyond. For 50 years Indonesia has silenced our voices. Today we are trying to tell our story to the world. We are asking people and Governments around the world to support the Melanesian in West Papua at every political and diplomatic forums and levels; MPs from different parliaments have formed the International Parliamentarians for West Papua (IPWP) www.ipwp.org and are pushing their government to recognize West Papua’s rights to self-determination. And Lawyers also formed the International Lawyers for West Papua (ILWP) www.ilwp.org. We are asking everyone to listen to our story and support this struggle for freedom, peace and dignity says West Papua Independence Leader and Chairman of Koteka Tribal Assembly (DeMMAK) Mr. Benny Wenda in Parliament House, Port Moresby recently. 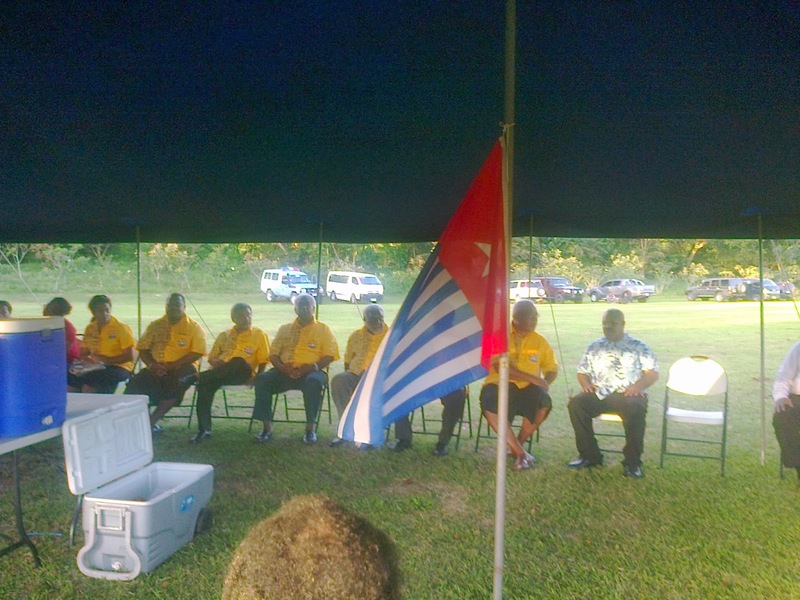 Melanesian Spearhead Group (MSG) Secretariat met with West Papuan community living in Papua New Guinea on 30 May, 2013 at Nature Park 14 mile, outside Port Moresby. Free west Campaign – Papua New Guinea Chairman Mr. Fred Mambrasar appreciated this visitation and special thank you to NCD Governor Hon. Powes Parkop, MP. FWPC -PNG CHAPTER. Powered by Blogger.